I love skirts. Let me repeat that, since it's so true. Yet, I get a lot of responses that are something along the lines of, "They look great on you, but I don't know what to wear with a skirt." Which makes me sad, because, well, skirts. So, I'm here to help! I've tackled the topic before, but wanted to share with you some specific examples for you to try. 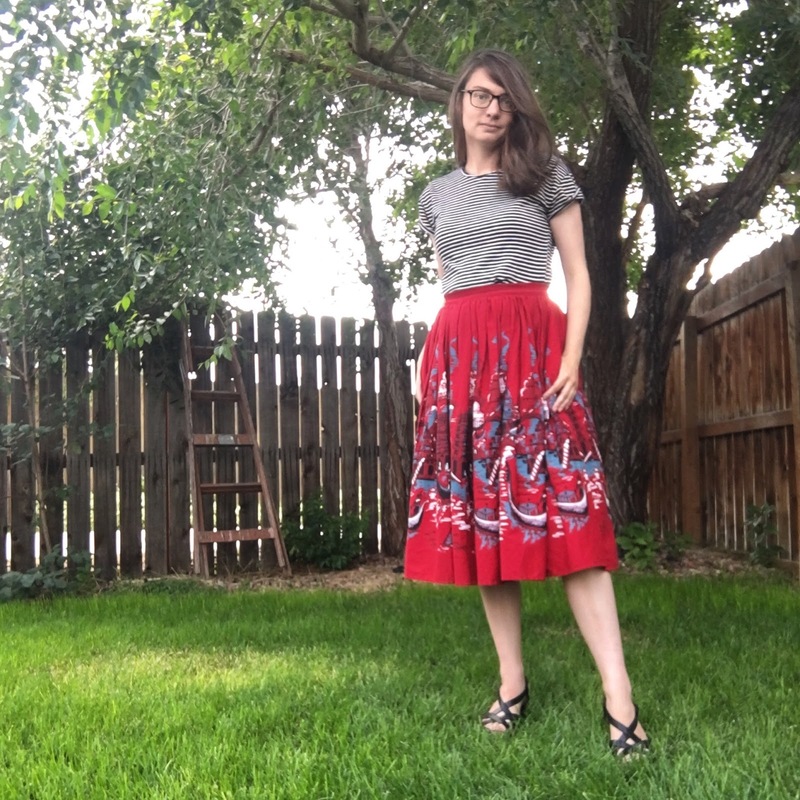 I love to pair button-down shirts with skirts. A white button down forever-and-always works with a skirt, if you're just starting out pairing up tops and bottoms. But I like branch out a bit. Gingham is having a moment right now in fashion, but it is really one of those patterns that will always work, especially when it is used on a very classic style of shirt, as shown here. The weather allowed me to pretend it was autumn for a few days, so here's what I wore. This look works for three reasons. First, I paired it with a neutrally colored top. Colored tops can work with skirts, of course, but a neutral means you have to think about color schemes less. You just throw it on and know it works. Second, the top hits at just about where the skirt is; I still have a defined waist. For some skirts, you might want to play with proportions. 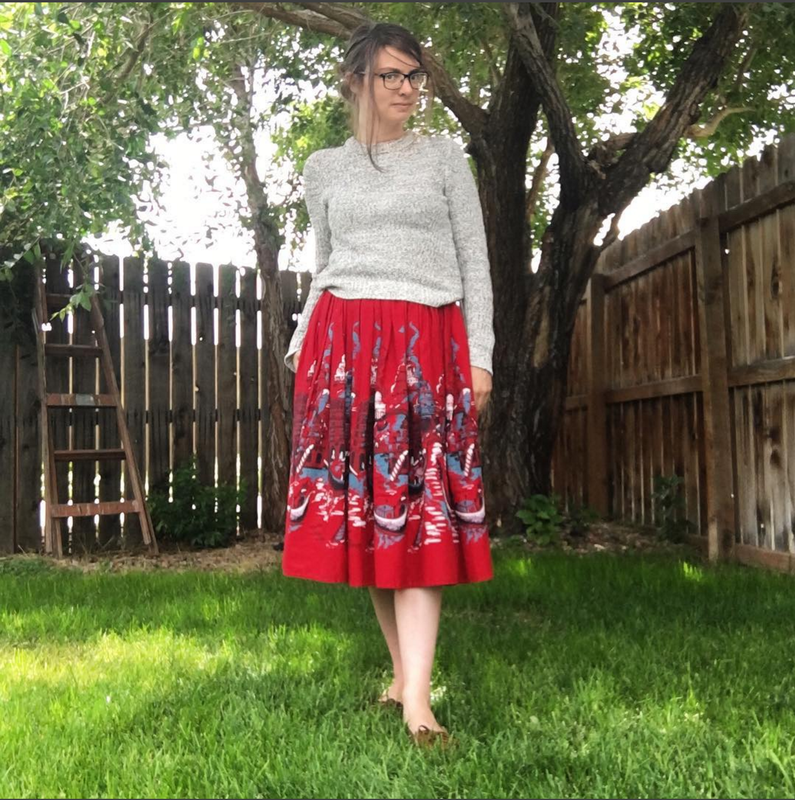 However, with a circle skirt like this, you almost always want to make sure the waist is defined somehow, because the bottom has so much fabric.With this look, I made sure the waist was defined based on where the sweater's hem was. For the other two looks, I tucked in the shirts. Sweaters are generally too thick to comfortably tuck, but for a shirt, that is an easy way to get a waist. Lastly, a chunky sweater dresses down the skirt. Sometimes skirts can come across as very dressy. Being able to make them more casual helps you to get more use out of your closet. By pairing a casual item with the skirt, you convey a sense of mood. This is actually true for all three of the looks I'm sharing today. They are all looks I could go and grab a coffee (er, a tea) in. This last look has two things happening that are a bit different. First, I'm wearing heels. Wedges to be exact. The other two looks had flats (my favorite shoe type). However, a heel can look great with a circle skirt as it extends the leg. Some people, especially shorter people, worry that a midi length hem can visually cut them up too much. If that's a worry you have, add heels. Wedges can be nice because they provide a little more support, if you're teetery, and they can be dressy or casual. The other thing that is noticeable here, is the striped shirt. Patterns-on-patterns (or patterns with graphics or pictures) can be intimidating, but some patterns can be treated like neutrals. Gingham in a navy or black (like shown above) is one such pattern. Stripes are another. Put stripes with anything and it nearly always looks good! 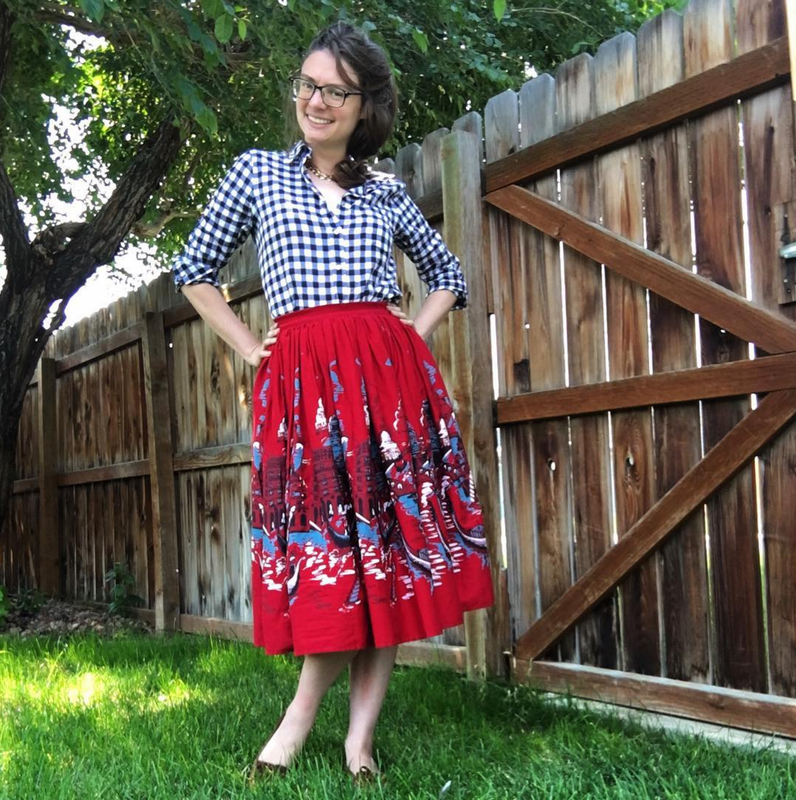 That skirt is so pretty, and I love the different ways you styled it!